Sweden's World number ones, Linda Jansson and Magnus Eliasson defended their titles as the Racketlon Tour moved on to beautiful Prague in late March. They were never in real danger en route to victory in the third Czech Open. Magnus Eliasson. Three tour event victories in 2007, so-far. In the Men´s Elite draw all eight seeded players booked their places in the quarterfinals. Belgian number one, Peter Duyck, was however close to suffer an upset against rising Polish star Krzyztof Samonek. The table tennis specialist was only beaten by four points after a thrilling tennis encounter that finished 24-22 in Duyck´s favour. Then Duyck himself was close to stun John O´Donnell in the most exciting of the quarterfinals. The match was all even before squash, where the Englishman once again proved his great skills. O´Donnell resides since a month in Stockholm and will have good opportunities in the near future to improve his clear weakness, the so important tennis discipline. The semifinals saw no surprises as top seeded Magnus Eliasson and Calum Reid defeated Marcel Weigl and John O´Donnell respectively. The final was a repeat of the exciting conclusion of the Canadian Open three weeks earlier. In the Toronto battle of generations, Eliasson was on the brink of defeat when Reid was up 16-12 in the squash after winning badminton for the first time against the mighty Swede. The Prague final became a much easier affair for Eliasson; He copied his table tennis win from Toronto, 21-19, but this time he did not let the young Scot come close in the badminton that ended 21-16. And after a miserable 0-10 start for Reid in squash the match was virtually over. - I noticed that Calum was tired and I played more short balls than usually in the squash game. In Toronto I tried to wear him down, but the tactics did not work out. I am happy with the way I played today, except for a lack of concentration in badminton when I went from 20-10 to 20-16, said Eliasson, who never had to play tennis during the whole tournament. In the women's class, Linda Jansson, surely had to play some great tennis to win the title. In fact Jansson is a former Fed Cup player for Finland with great tennis skills. 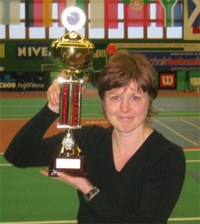 Jansson won her first international Racketlon title last year in Prague after an overwhelming display in tennis, which was won 21-0 against the hot favourite Lilian Druve, who now has retired. Jansson's second straight title in Prague. This picture is from last year's Czech Open. This year Jansson once again showed her strength in the white sport winning all five tennis matches on the extremely fast courts in the Czech capital. But it was rather her surprisingly strong badminton that was the key to victory. In the semifinal Jansson only dropped eight points to home favourite Martina Kakosova and in the final the talented Swede managed to collect seventeen points from runner-up Susanna Lautala-Näykki. Lautala-Näykki, the new world number one according to the 1 April rankings, was all even with Jansson before tennis and was sensationally 7-3 up in the final discipline before Jansson found her rhythm and secured a 21-11 win. In the bronze medal match Martina Kakosova pleased the home crowd by beating Silke Altmann, who played her first tournament since the German Open last year. Altmann will probably compete in the World Championships in Rotterdam later this year but will only play in a very limited amount of tournaments leading up to it. Sweden has now captured the titles in the Men´s and Women´s Elite classes in all three editions of the Czech Open. But although Eliasson and Jansson both live in Stockholm, they have two opposite playing styles. Eliasson is probably the most well trained athlete the Tour has ever seen. The former ice hockey professional leaves nothing to chance and plays every point like if it was a match point. Jansson has a more relaxed approach to the sport. The drop shots and acute angle play is her distinguishing mark. 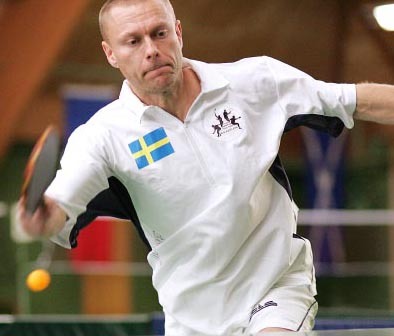 If you would take the best parts of Eliasson och Jansson and put them together you would for sure create an almost unbeatable Racketlon player. Unbeaten in Prague was indeed Paul Sach. The young German won both the Junior class and the Men´s C category. The Men´s B class was dominated by Zoltan Czingraber of Hungary and Jacob Devries was strongest of the senior players. The doubles classes were won by top seeded Dickert/Krenn and Kakosova/Sochor. The Czech Open gets better for each year and the organizing crew did a great work. Many top players visited the Club Hotel Praha/Pruhonice this year as well as many newcomers including e.g. Czech Tennis star Radka Pelikanova, who made her Racketlon tour debut. Her highest ATP tennis ranking (from August 1998) was 191. FIR President Marcel Weigl hinted that Prague might well be the host of a future World Championship. The hotel is located in the same building as the sport center which is quite unique and a luxury for the players, just like Båstad or Halle on the Men´s Professional tennis circuit. On the other hand the same professionalism was not seen among all competitors. Most players are fair, but unfortuately cheating is too common on the Racketlon tour. It happens that balls who clearely hit the line are called out, there is much shouting of improper words and the time violations are many. The problem is biggest in squash and this is something the International Federation has to address in the future.